Shadows over Vathak blends the Otherworldly, Cosmic Horror themes of New England's Lovecraft, the Macabre Mysteries of Poe, and the sensibilities of Victorian, Gothic Horror Adventure into an original fantasy setting for the Pathfinder Roleplaying Game. As players, your characters fight to survive in a land threatened with destruction by the rise of the ancient and evil Old Ones and their spawn. Your characters may represent points of light in the darkness or give in to dark temptations. Most will fall somewhere in between — survivors struggling to eke out another day. Though the followers of the One True God speak of divine providence while battling the Old Ones, the sins of the Church often rival those of their enemies. In the world of Vathak, your character’s perceptions of heroes and villains is a thin line drawn by their own personal morality and, of course, determined by the victor. Included in the Shadows over Vathak: Player's Guide you will find: A thorough introduction to the world of Vathak, a land and people struggling against ancient evils. Suggestions and setting-specific mechanics to help you create and play characters in a horror game. Rules and options for the 9 playable races of Vathak, from the tribal bhriota, to twisted cambions, ghostly hauntlings, and much more! Complete write-ups for 4 new classes of Vathak, with at least 2 archetypes for each of the 36 core and base classes, including the occult classes. Detailed rules for crafting firearms and 50 feats to help you make your characters unique and suited for the horrors of Vathak. A rich selection of weapons and armor, new and old, with options for tools, alchemy, vehicles, and other gear needed to survive Vathak. An entire chapter expanding on both early and advanced firearms for the Pathfinder Roleplaying Game, the only thing keeping the horrors at bay! 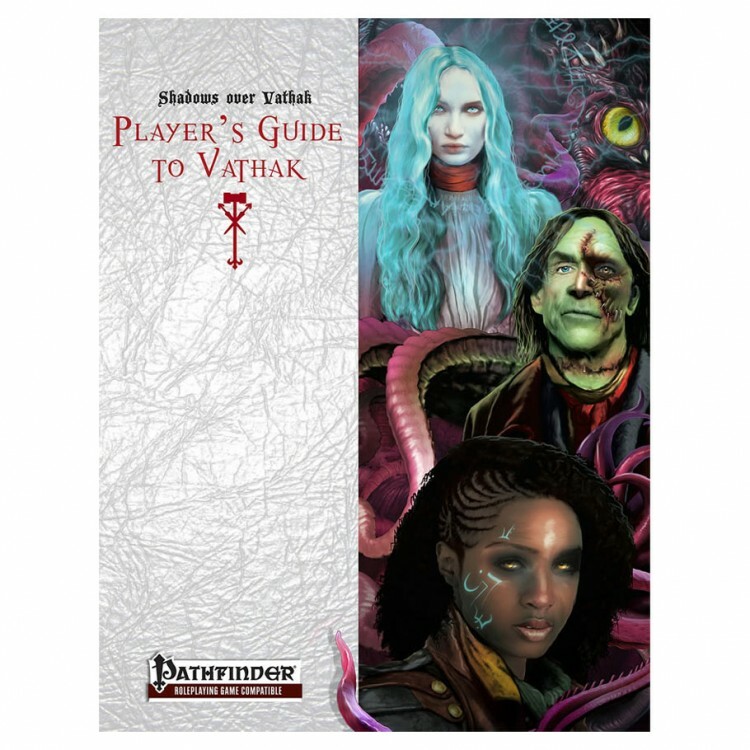 A rich discussion of each of the major religions of Vathak, from the Church of the One True God, to the romni Court of Signs, and the cults and secret societies of the Old Ones! Topped off with a discussion of magic in Vathak, with new options for divine casters, and a vast set of spells perfect for Vathak.